The Australian mobile phone market exceeded growth expectations, shipping 3.36m devices in the fourth quarter of 2017 -- 15.7% year-over-year (YoY) growth. According to IDC, 92% of handsets were smartphones whilst the remaining were feature phones in the quarter. Growth came primarily from Apple’s newly released iPhone X, as the device hit stores countrywide, notes the research group. 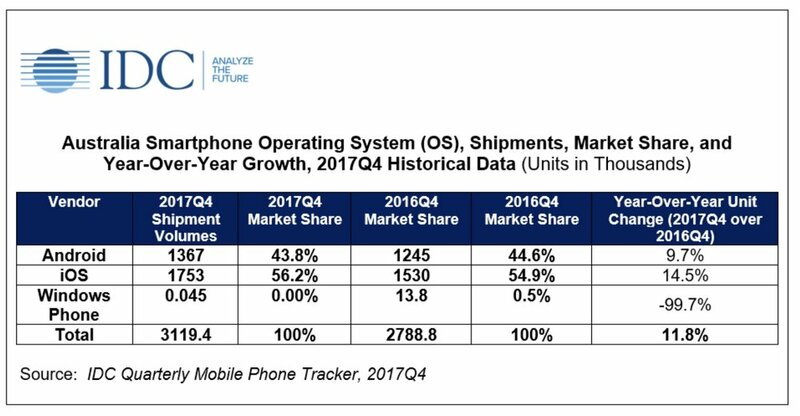 After leading smartphone shipments in quarter two and quarter three, Android conceded the lead to Apple’s iOS in quarter four. “Riding on the back of the very successful iPhone X launch, the tables have turned, and iOS has not only returned to the top but stretched its lead to grab 56.2% share compared to 43.8% for Android," says Bilal Javed, senior market analyst at IDC Australia. After the lower demand of iPhone 8/8 Plus compared to its predecessors, Apple extended their lead at the top in quarter four of 2017 where they grabbed 56.2% of the smartphone market. Samsung was able to hold second spot even after their share dropped to 15.4%. Windows powered phones didn’t make the cut, hindered by a lack of new devices and apps on the platform across both consumer and commercial segments, according to IDC.